A long exposure, you can tell by the airplane streaks near the horizon. Walking that fine photography edge of long enough to get the exposure, but short enough not to distort the stars too much. Viewed from the road, this desert park only hints at its vitality. Closer examination reveals a fascinating variety of plants and animals that make their home in this land shaped by strong winds, unpredictable torrents of rain, and climatic extremes. Dark night skies, a rich cultural history, and surreal geologic features add to the attraction of this place. 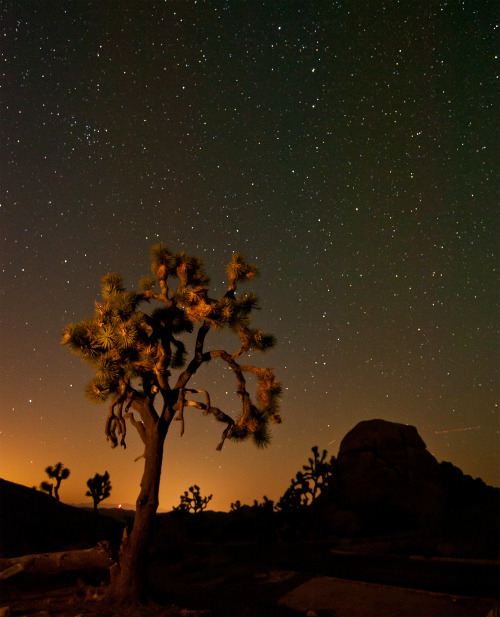 Come see Joshua Tree National Park for yourself! This entry was posted on Sunday, January 19th, 2014 at 2:23 pm and is filed under Geography - Physical, National Parks, Outdoor Recreation, Travel. You can follow any responses to this entry through the RSS 2.0 feed. You can leave a response, or trackback from your own site.